South Mountain Park is the largest municipal park in the world. It consists of a range of mountains thirteen miles long across the southern part of Phoenix, Arizona. Hang Gliding has been a recognized sporting activity in the park since the early 1980's. The Arizona Hang Gliding and Paragliding Association and the Parks, Recreation and Library Department have agreed to a set of guidelines for flight operations in the Park. 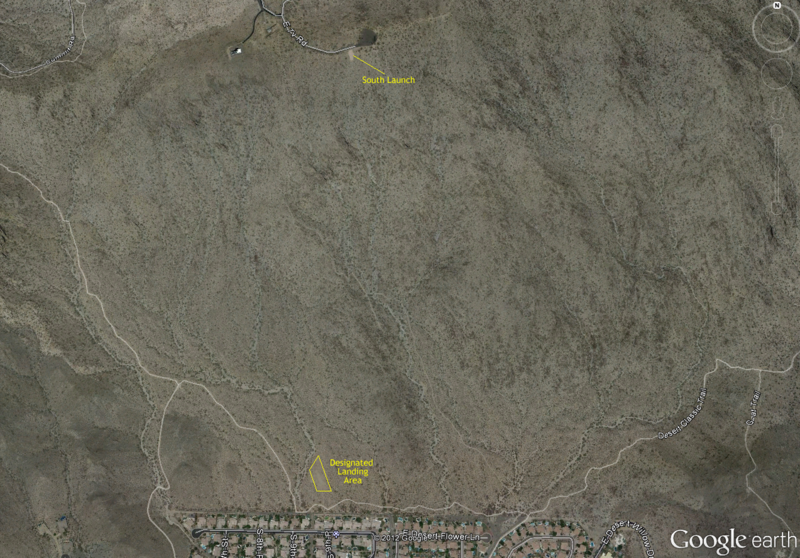 The Master Plan for South Mountain Park, adopted by the City Council confirmed hang gliding as an appropriate use of the park and specified areas for launching and landing hang gliders. As the sport of hang gliding has grown the variety of hang glider types has grown as well. Now known as un-powered ultralights hang glider types include flex wings, rigid wings, paragliders, and ultralight balloons. No commercial operations or instruction permitted within the park. DO NOT park in front of the gate at the Kart Track which is near the north side landing area. Park only in designated parking areas and spots. DO NOT hike or venture off designated trails. DO NOT land at school directly south of south launch while in session no exceptions. Requirements: H3, H2 sponsored, P3, P2 sponsored. Show valid USHGA and AZHPA IDs upon request. Visiting pilots can obtain a visiting pilot pass here and show the registration/payment form as proof. Radio info: USHGA standard business band frequencies. Local weather info on 162.550 MHz. Land ownership: City of Phoenix Municipal Park. Other use: Heavily used by general public for sightseeing, horseback riding, hiking, bicycling and more. Can be considerably crowded during special events and on weekends. Emergency: Several hospitals near park. Maintenance: Arizona Hang Gliding & Paragliding Association. Orientation: Faces 180 degrees at 2625' MSL, PG and HG friendly. Winds: SSE to SSW 0-??mph. Summer evenings are usually too west to fly from the south launch. Directions: Take Central Ave. south to the park entrance. 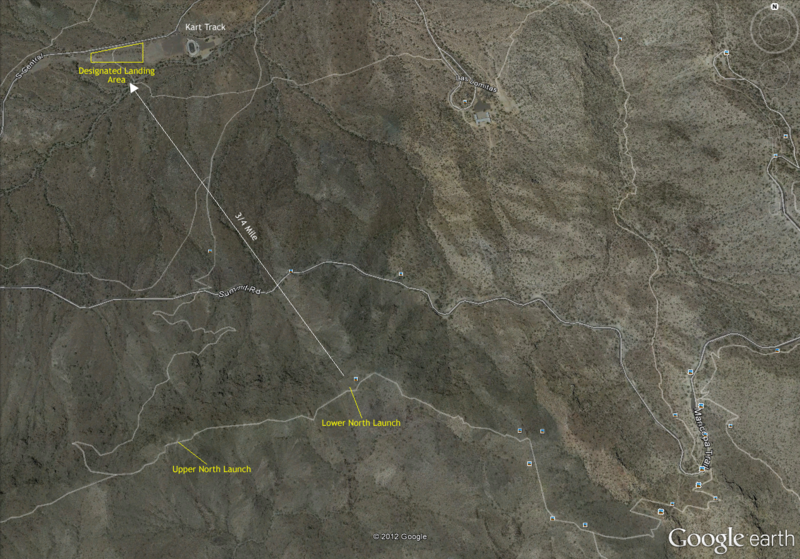 Follow the two lane, paved road 7.5 miles to the top, following the signs to "Gila Valley Lookout". Conditions: Two-lane paved road to launch (7 miles). 25 MPH speed limit, no passing. Parking: Marked for up to 30 vehicles. Facilities: Ranger station just past park entrance and at most lookouts. Setup area: Unlimited in parking lot. Don't block road. Hazards: Unmarked power lines to the right of launch. Very difficult to see. Locate them before you fly. Orientation: Faces 340 degrees at 2300' MSL, PG and HG friendly. Winds: NW to NNE 0-20 mph. Can be launchable in the evenings when the south launch is indicating west winds. Directions: Same as for south launch. Follow road to 2.5 mile marker and park at the next pullout. The Ranger Trail is right at the 2.5 mile marker. Very good trail, moderate slope, about 30 minute hike. Follow trail to the ridge top on the east side of ravine. Launch is at trail marker. Excellent no wind HG launch is on the left, PG launch on the right. Setup Area: Don't block trail or damage vegetation. Restrictions: Class B airspace starts at 5000' MSL. Please refer to the Phoenix Terminal Area Chart. Hazards: 300' radio towers, unmarked power lines, lots of air traffic flying under the Class B. South Side: Straight in front of launch, just before the houses, visible from launch as a small, circular, bare patch. Has slight downhill slope to the south. Paraglider pilots should set up their approach so as to not overfly the wash to the west of the LZ and plan on landing short of the LZ to compensate for the famous South Mountain Pop. Much of the terrain around the LZ is usable for landing, just avoid getting popped and floating into or close to the houses. Directions: From I-10, take Pecos Rd. west to Desert Foothills Dr. Take Desert Foothills north for two miles, turn right on Granite View Dr. Drive to north end of street. Walk along rock wash to the main trail, turn left, go west 200 yds to LZ. Conditions: Paved roads in residential area with schools. Facilities: Ranger station just past park entrance on North side and at most lookouts. Hazards: Many tall saguaros and chollas. Ravine bordering West side of LZ. Restrictions: Don't walk off trail. North Side: Straight in front of launch is the Kart Track. Its got a large paved parking lot and a big open dirt area to the west, the LZ is the dirt area to the west, not the parking lot! Wind sock should be just to the west or northwest of the large dirt area (check on your way up). Do not land in the Kart track parking lot, its a very good thermal generator and has been known to kick off some good ones, the asphalt surface doesn't do your wing any good either. Much of the terrain to the west of the large dirt area is usable as well. Its not a good idea to approach low over the deep wash that is just south of the Kart Track. Its claimed a few victims over the years. Directions: You pass the landing area on the way to launch, fairly obvious, locked gate. Do not park in front of the gate or block the road into the parking lot. Contact an AZHPA member before you go and they can open the gate for you, help with parking and rides up to the saddle. Restrictions: Don't walk off trail. Do not park in, use or land in the Kart Track if any Kart Racing/Practicing is going on. Hi, I'm P2 rate Canadian (66 flights, 25 hours, dynamic and thermal experience) and I'm looking for a place to flight in march 2018. Is this possible in Arizona and how can I be sponsored (cost)? And is march a good time to flight in Arizona? Hi Jean, you can fly South Mountain with a local P3 mentor, or head up to the craters in Flagstaff. We also do a lot of towing, and the southern AZ group has some more P2 sites as well. Let us know when you're here and we'll make sure you find pilots to fly with. There are no tandem flights over the grand canyon due to air restrictions, but we'd be happy to find you someone in either Flagstaff or Phoenix to fly with.